Trinity College Dublin, the University of Dublin welcomes international students from all over the world. Students from 122 different countries currently study with us. Students can choose from over 600 courses covering all disciplines across 3 faculties and 24 academic schools. Applicants from EU/EEA countries would normally be defined as EU applicants and apply via CAO, whereas Applicants from non-EU/EEA countries would normally be defined as non-EU applicants and apply directly to Trinity via the my.tcd.ie portal. Please note this is based on residency rather than nationality. If you are interested in coming to Trinity after high school, you may be eligible to apply directly to our Undergraduate programmes, or it may be more suitable for you to apply though our Trinity International Foundation Programme. 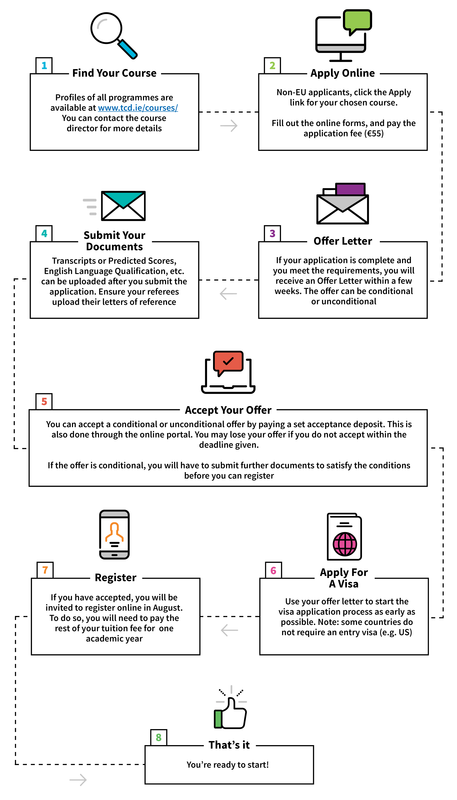 Please see the Entry Requirements for International Students section to see the general requirements for international students, and visit your specific country page for more detailed information on the entry requirements relevant for your country. Here you can check if your high school qualification makes you eligible for direct admission to undergraduate programmes. If you have finished a primary bachelor's degree, you may be eligible for a place on one of our taught Postgraduate Programmes. Please visit your specific country page to see the relevant entry requirements for postgraduate programmes – and further course-specific requirements are listed in the course profiles. All applications for Trinity courses are made online – no hard copy documents are required. The processes for applications for our Undergraduate programmes and Postgraduate programmes are all explained below. Start by checking the entry requirements section for your specific country to see if you meet the general undergraduate requirements. Some courses have further course-specific requirements, which you can check in the course page here. This contains the list of all available courses and the application link. Once you have chosen your course, apply by selecting the 'Non-EU Application' link at the course specific page. For more information, please see the Academic Registry pages. Undergraduate Student Pathway Click here to view the undergraduate student pathway infographic. You can find a listing of all postgraduate programmes here. The course profiles give a description of the courses, as well as specific entry criteria and the application link. There is also contact information for the Course Directors who can answer more detailed questions. Once you have chosen your course, apply by selecting the 'Non-EU Application' link under the course description. Please note that some of our programmes are part-time, and visas are granted only for full-time courses of study. The deadline for application for most masters' courses is 30th June, but some have different deadlines – you should check the course profile for details. Postgraduate Student Pathway Click here to view the postgraduate student pathway infographic.